When a 6 petals item is all packaged and shipped to a new home, I always wonder what space it will end up in or how it will be used. 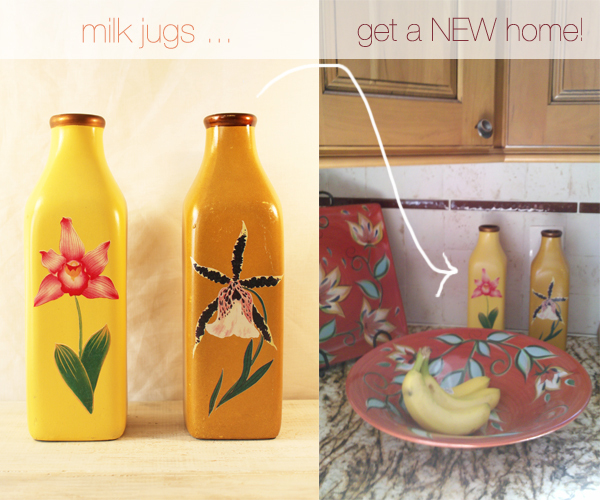 Janis, the new owner of these vintage, hand-painted milk jugs from 6 petals, sent a picture of how she decorated with them in her kitchen. I love all the rustic colors...and, check out those beautiful granite counter tops! Thanks so much for sending this, Janis. I'd love to see how you've styled your new 6 petals items. Keep the pictures coming-- email me.